Essay aus dem Jahr 2011 im Fachbereich BWL - Rechnungswesen, Bilanzierung, Steuern, , Sprache: Deutsch, Abstract: Once a founder complies with their commitment to initial contribution in the form of contribution in kind, a question arises about valuation of this in-kind contribution. Given the principle of continuity in fiscal statements between initial balance sheet and future annual statements, valuation of such in-kind contributions needs to refer to provisions of commercial law. 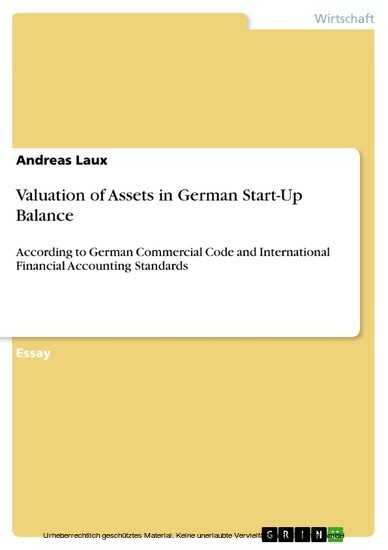 However, §§ 242 and 253 of German Commercial Code (HGB) only provide general guidelines to refer in the measurement of in-kind contributions at enterprise formation to acquisition costs, which gives rise to the term of notional acquisition cost. With the regulation gap this leaves, the in-kind contributions can essentially be measured freely under common provisions. The values notional acquisition cost may assume range from fair value as maximum limit to the lower issue price of the shares subscribed as far as hidden reserves have been created. The author undertakes a comparison of the aims in financial reporting to HGB and IFRS respectively in as far as relevant to valuation of the in-kind contributions, explores the different views on the scope of notional acquisition cost and extracts from the aims of financial reporting to the core question about the essential allowability of hidden reserves in initial balance sheet the key decision making criterion to refer to in valuation of the in-kind contributions. The descriptive exploration of the different views in existing sources as to the scope of notional acquisition costs and the comparative analysis of pertinent provisions of HGB and IFRS respectively give rise to the author's conclusion and requirement to valuate the in-kind contributions at fair value.